Espress-o-Ville was one of Satya’s popular haunts for folks who just wanted a good cup of coffee with a few books by their side, or a round of serious Scrabble without the DJ spinning mean tunes. 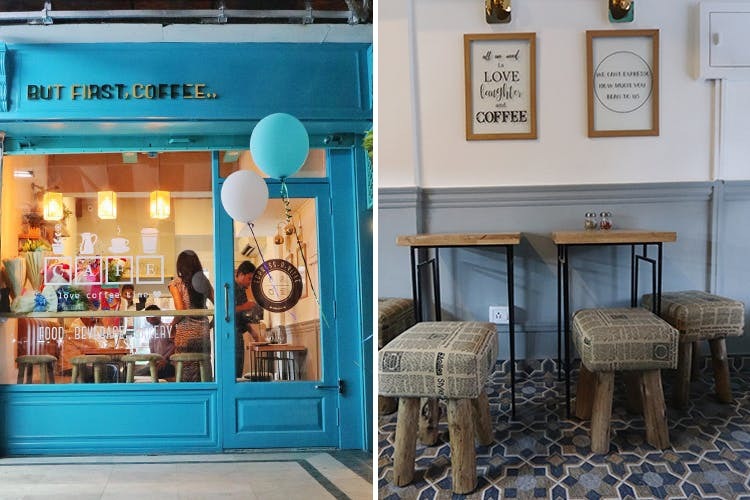 With its quiet, cute vibe intact, it’s now opened a tiny branch in GK II. We were earlier than the early birds and decided to catch them on the day they opened. With their inaugural bouquets still in full bloom, and the freshly-painted teal door gleaming, they instantly reminded us of their older cousin from Satya. Now yes, this outlet’s pocket-sized with just enough place for 6-7 people at a time, but we love that it still comes together rather well. These good coffee folks are going with the same menu, and variety isn’t going to be an issue here. You get to pick from sandwiches, pasta, burgers, salads, our favourite gourmet brekkie, crepes and cakes. We began with their Espresso Spritzer, that made us believe that, in some strange culinary heaven, watermelon, rose, soda and espresso can unite in holy matrimony. The cappuccino didn’t blow our mind as much as the Spritzer, but it could have been because we were too preoccupied decoding the latter’s flavours instead of focusing on our modest cuppa. We had their famous Maggi Festa as well, and managed to partially wrap our head around what the fuss was all about. So, if we hadn’t arrived already full from a late lunch, we’d have relished this carbo-load a lot better. The baked cheesecake, though, was something else; the very picture of our junk food dreams. Like they say, someone’s loss is someone else’s gain. South Campus students will sure miss this gem, but for now, we’re just rejoicing that we can pop in for their waffles and pasta whenever we’re around GK II, S Block. Also, we’re loving that it’s away from the main market’s hustle-bustle.